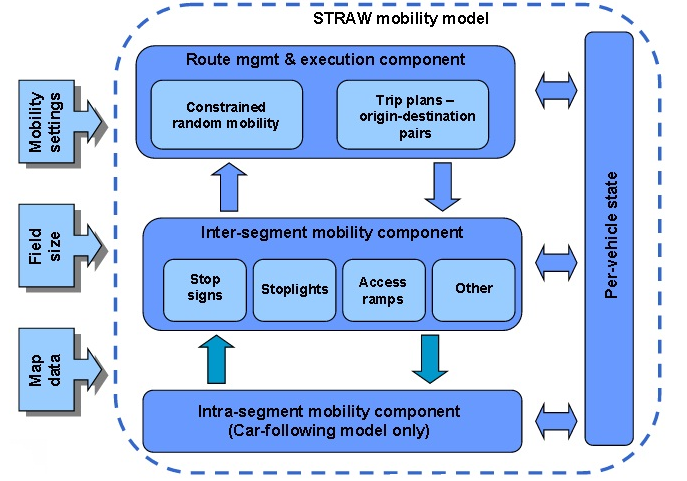 STRAW Simulation is called as Streetrandom WayPoint mobility model. Random waypoint model simulation does not need require origin destination information. Straw Simulator involves in determining vehicle’s trajectory at each intersection. For Example (traffic control.speed limits and multiple lanes). Loads free map data for entire US. Used for Route Management and Execution Component. STRAW simulator is implemented as part of SWANS ( Scalable Wireless Ad-Hoc Network Simulator). More realistic appropriate details are available for Straw Simulator. Accurate network simulation for vehicular network is performed using Straw simulator. Loads Road Segments, Names and Shapes for Rectangular Region. Nodes placed on rabndom streets and lanes. Intra Segment Mobility supports car-following model, cruising speed and acceleration/deceleration. Inter Segment Mobility supports timed stoplights, stop signs and highway merge. Provision of effective mobility aware communication protocols.